Ahhh, Vlad and Bo. Bo and Vlad. They are causing quite the buzz among Jays fans and within the prospect community, and for good reason. You have to go back 23 years to 1995 to find the last time the Jays had two prospects in the Baseball America Top 10, as they had Shawn Green (6th) and Alex Gonzalez (8th). The previous year saw Gonzalez (4th), Carlos Delgado (5th), Jose Silva (10th) with Shawn Green in the top 25. More recently, the last Jays prospect in the Baseball America Top 10 was Travis Snider, who was the 6th ranked prospect in 2008. Noah Syndergaard was ranked 11th with the Mets, after the infamous R.A. Dickey trade. The following links and rankings are inspired by 'Prospect Week' over at FanGraphs. Keith Law and Baseball America recently released their updated Top 100, so it seems like a good time to dive into some of the great content these prospect scouts give us. A lot of the opinions I form about prospects are heavily influenced by what these guys see and report. I don't get the opportunity to really watch as much minor league ball as I'd like. I'm pretty compelled to watch more of Vlad and Bo before they get the call to the bigs, so I'll likely look into MiLB TV this year. Well, let's start with the FanGraphs Top 100 lists, put together by prospect analysts Eric Longenhagen and Kiley McDaniel. McDaniel was previously the lead prospect guy at FanGraphs, and was working within the Atlanta Braves organization before re-joining FanGraphs recently. The 'Making of the Top 100' is a pretty good back and forth and is worth a read to see how they come up with their FV grades. 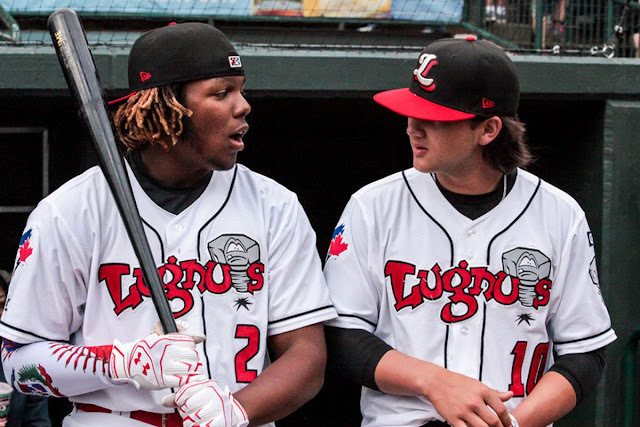 I love Vlad Jr. and I could write about him all year, and I just might. The comparables are getting a bit out of control - I'm hearing Albert Pujols. Miguel Cabrera, even his dad - either way, it's fair to assume he's going to be an impact hitter in the MLB. His potential is limitless- he could become the cornerstone of this franchise. He also seems like a very marketable player and has the all the tools to become a middle of the order hitter. Some footage of him can be found here. Because of his body-type and range defensively, it seems the FG guys have him moving to first base eventually, which is probably the only thing holding him back from being the top prospect in all of baseball. It's also why the KATOH projections might be lower on him than in the past. As pointed out by Tim, his KATOH WAR production at the start of last season was 18.9, which went to 19.6 in the mid-season update. Inexplicably, it fell to 8.8 this year despite posting a 179 wRC+ as an 18-year-old at High-A. The defensive limitations could be a concern to the system or the adjustments that were made that reduces the importance of contact rates at lower levels. Typically the further away a prospect is the risk and variance increase as well. Regardless of the projections, Vlad Jr has all the tools and marketability to become a superstar in this market. I'll take the over on 8.8 projected WAR. While we're talking about Vlad, it's led me to look back on Carlos Delgado and what scouts were saying about him when he was a previous top 10 prospect. Delgado was raw defensively, questions of whether he will stick at his position (he came up as a catcher), but had a combination of plate discipline, power, and a hit tool that was incredibly advanced for his age. These are similar things being said about Vlad, which makes me not worry about the glove because the bat should have the ability to play anywhere. Obviously, these are different times, but these are both the same levels at the same ages. Delgado improved his line as 19-year-old in High-A and debuted with the Jays at the age of 21. I doubt Vlad will have to wait that long. Delgado accumulated 44.2 WAR over his career despite being graded as a poor defender at first. Would be hard to complain if Vlad Jr. had a comparable career. Sky is the limit. The biggest riser of the 2016 MLB draft after being selected 66th by the Jays, 2017 couldn't have gone any better for Bichette. He's hit at every place he's been, despite being young for each level and showed no signs of slowing down after a mid-season promotion with Vlad to Dunedin. The bloodlines run thick with the Jays pair of top prospects, having both came from baseball families and growing up around the game. There has to be a correlation between father-sons in sport as I've noticed it more and more lately, both in hockey and baseball. One quick note about Bichette. I often see him mentioned in the same breath as Vlad, but I think Vlad is a tick above him. I just think Vlad is in a tier by himself. As much as I love Bichette as a prospect, I would have entertained the idea of including him in a Christian Yelich trade, if those rumors were true. Simply because you have 5 years of control over Yelich and he can be a core piece for years to come. There's few, if any, other players rumored to be available that it would make sense to consider moving Bichette and Yelich is one of them. I'd bet the Marlins wanted Bo+ a significant piece though, which starts to deplete the rest of the farm as well. It could end up being the best trade Ross Atkins never made. Anthony Alford has those loud tools with power and speed that scouts love, and if he can be a plus defender in center he has a sky-high ceiling. It's important to remember that he's a raw talent, who has missed out on development time to football and injuries. He's had just under 1400 career at-bats despite being 24 years old and is a good example of how player development isn't always linear. I think the organization has set him up with a perfect position to succeed - he's all but guaranteed to start the year in Buffalo, but he has the pedigree to force his way onto the roster if he is playing well with the Bisons. They also haven't blocked him from a spot in the outfield - Granderson/Pearce, Grichuk, and even Kevin Pillar aren't really barriers to him getting playing time if he proves that he belongs. Danny Jansen seemingly broke out last year, and the guys at FanGraphs are the only major lists that I've seen with him in the top 100. He hit really well in a small sample last year in Buffalo, with a 172 wRC+ in 78 plate appearances. His K% dropped almost in half in 2017, which likely helped fuel his breakout. If he has the chops to stick behind the plate defensively he has the bat to be a good MLB regular. I feel like going into the season the rough plan is to have Reese McGuire (who was noted as having a KATOH projection of 4.3 wins) enter the season backing up Martin with Jansen getting regular reps in Buffalo. I could be reading this situation entirely wrong, but McGuire seems like he's basically polished at this point and Jansen still can use the additional playing time while grooming to be the heir-apparent to Russell Martin. Holy hell is Atkins high on Pearson: "if teams had another month of information on him - his time with us in Vancouver - he would've gone 1-1." The Jays have the perception of having a top-heavy farm system, but they have useful pieces throughout the organization that can be interesting in a number of different ways. There are fallers within the system - Dalton Pompey and Max Pentecost come to mind - but those were a result of the injury bug. I wouldn't completely rule out those guys just yet, but I have a feeling they might end up getting an opportunity elsewhere. Lourdes Gurriel didn't have the greatest professional debut but he at worst projects as a utility guy, and could become a regular with increased contact. I've heard good things about Joshua Palacios, a former teammate of Vlad and Bo's in Lansing, who was a 4th round pick. Recently acquired Teoscar Henrnadez provides another layer of cheap depth for the outfield, and could probably produce similar value to Grichuk if given the opportunity. Notably, there are interesting arms as you scroll through the list. Keith Law is particularly high on Brazilian signee Eric Pardinho and Ryan Borucki, and had them above Sean Reid-Foley and TJ Zeuch. I still haven't given up on SRF despite the down-year, though the command issues are a little worrying. Borucki is basically a lock to see some starts in the majors this year, barring a few other additions or an unlikely repeat of the rotation health from 2016. As for Pardinho, he was a top international signee at $1.4 million and just turned 17 in January. Obviously, he is far away, which carries inherent risk, but he has hit 97 on his fastball and has a plus curveball for his age. That's enough for me to take notice and monitor his progress this year, though I really haven't seen or heard much about him since he signed. Overall, Baseball America has the Blue Jay system ranked as the 7th best in the game, despite the lack of overall depth. Having two players in the top 10 will definitely boost the rest of the organization. With the way the game is trending, it is important to be able to draft and develop a core from within, and then supplement the pieces you have via trade and free agency. A look at the Dodgers and the Yankees spending (Stanton trade aside) this year has to highlight how the game is shifting younger. I'd take the elite ceiling guys the Jays have (Vlad, Bo, Pearson, Alford) over some of the deeper systems that have more depth but less upside. Regardless, Ross Atkins and Mark Shapiro have done a good job building the farm. In the next few years, we should start to see some of the homegrown talent emerge on the big club.